Weeping cherry trees, sometimes called weeping snow fountain cherry trees, have noticeable branches that droop gracefully over the trunk and produce a cascade of white or pink flowers in the spring. Keep weeping cherry trees healthy to encourage showy blossoms each year of the tree's life. 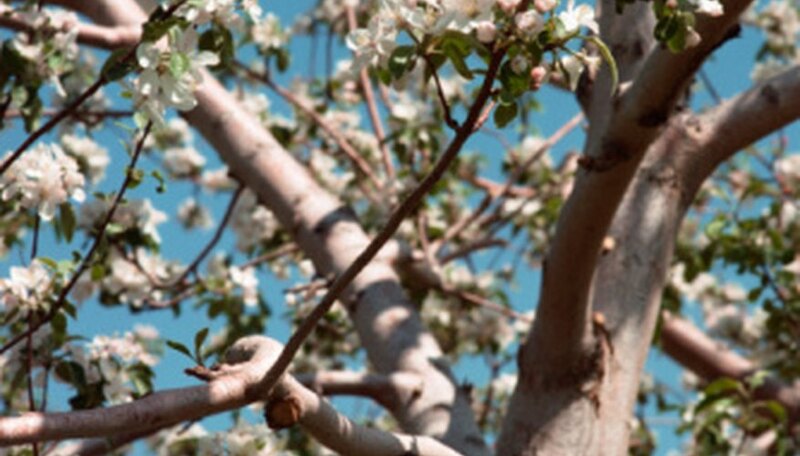 Fertilizer is one way to make sure cherry trees stay healthy. Fertilizers provide weeping cherry trees with the nutrients they need to grow successfully, produce blossoms and fruit and fight off diseases and pests throughout the growing season. The nutrients contained in fertilizer are usually nitrogen, phosphorus and potassium, among others; the main nutrients contained aid all functions of tree growth, from leaf production to the creation of flowers. Adding fertilizer to the ground around a weeping cherry tree keeps the tree healthy. Do not place fertilizers directly on the roots of the weeping cherry tree because it traps moisture and nutrients above the soil, which can lead to fungal diseases. Apply an even layer of fertilizer to the ground around the base of the cherry tree, staying 6 inches to a foot away from the actual base of the tree. Spread fertilizer before it rains or water the ground after fertilizing to help mix the fertilizer with the soil. Apply fertilizer to the weeping cherry tree in the early spring to give the tree the nutrients it needs to produce healthy, attractive blossoms during the rest of the spring. Early applications of fertilizer give the tree nutrients for growth throughout the rest of the season. You can apply some fertilizers twice; follow all directions on the fertilizer to ensure that you use the correct amount to avoid problems with fertilizer burn. Several types of fertilizers are available, from granular spreads to fertilizer spikes. Fertilizer spikes are stakes of fertilizer that are pounded into the soil around the weeping cherry tree; they provide slow release nitrogen and nutrients to the tree throughout the growing season, which removes the need for extra applications of fertilizer. Granular or spread fertilizers allow the weeping cherry tree to receive nutrients more quickly, which helps encourage growth in the spring.